We have compiled a windows binary from the latest (source) of ccMiner 1.5-git fork by tpruvot as he has added support for the Extra Nonce feature used by services such as NiceHash or WestHash to maximize the mining performance. 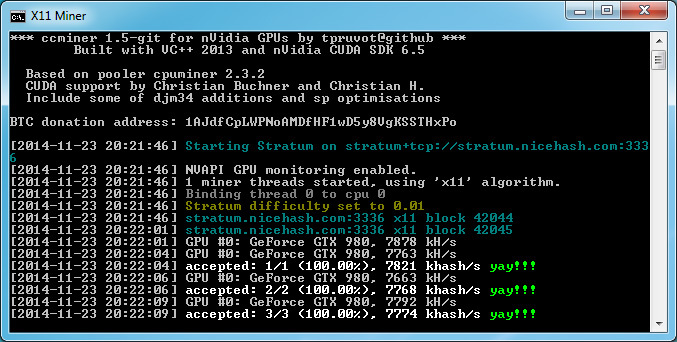 So if you are currently leasing your Nvidia GPU mining hashrate at NiceHash or WestHash you might want to try out the latest code of this ccMiner fork. Do note that there is still no official release of 1.5 by tpruvot and this windows binary is compiled from the latest source available on GitHub. There are also some increases in performance as compared to the previous release, so you should notice a slightly better hashrate in some algorithms. The windows binary available for download below is compiled for Compute 3.0, 3.5, 5.0 and 5.2 Nvidia GPUs using VS2013 and CUDA 6.5, so make sure you have updated your drivers if you still don’t have ones installed with CUDA 6.5 support.